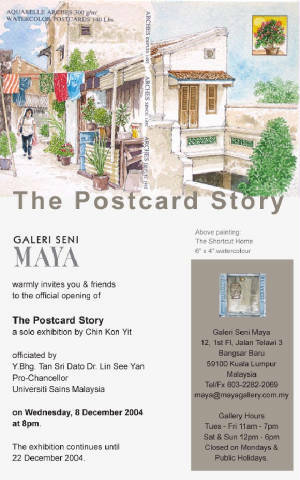 Chin Kon Yit - " The Postcard Story"
The Postcard Story showcases over 60 pieces of postcard size watercolours by an eminent local watercolor artist Mr. Chin Kon Yit. 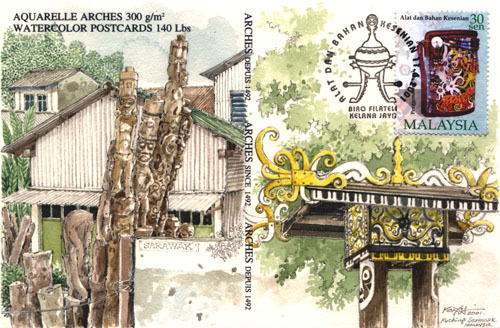 In recently years, Mr. Chin has been responsible for the making the visual records on important local architectures, in books like "Kuala Lumpur- A Sketchbook" and "Penang Sketchbook". 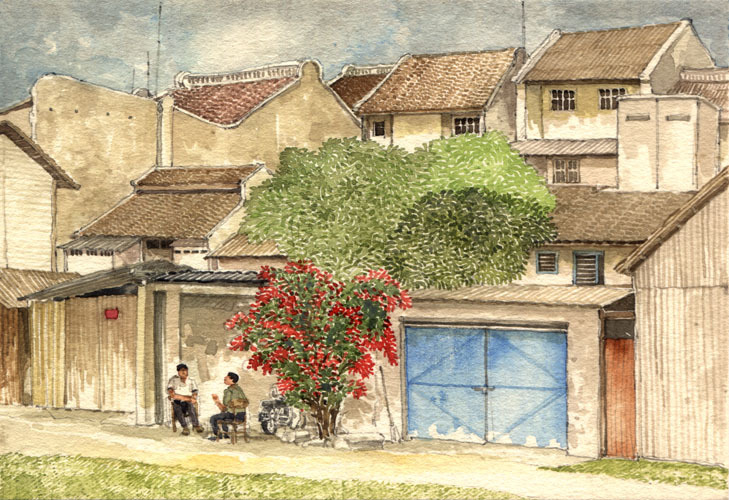 While involving in these projects, Chin Konyit has also been consistently working on his own watercolor series. 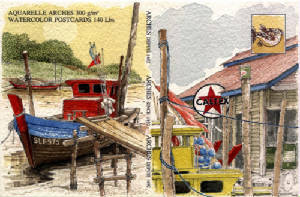 These over 60 pieces of postcard size watercolors are Chin's personal sketches collection dated from 1989 to 2004. Chin's works may have not been eye catching, but certainly enduring. The miniature sizes of this series demonstrate Chins master skill in manipulating brush strokes and lines in a small surface. He cleverly combines the pointillism painting technique with an excellent sketching skill to create these brilliant little pieces of postcard painting. 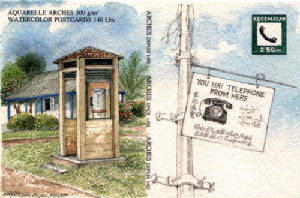 In general, The Postcard Story indicates a subtle change in Chin's watercolor style - more gentle lines and delicate brush strokes - that has endowed rich visual textures to his works. No complicated manifestation, Chin's paintings are friendly and approachable. For Chin, it was a childhood to be a professional artist. He believes that painting can be as simple as capturing what is meaningful and beautiful in everyday life, and that artists should be visually sensitive to his/her surrounding, and be able to portray the ordinary through the extra-ordinary perspective. 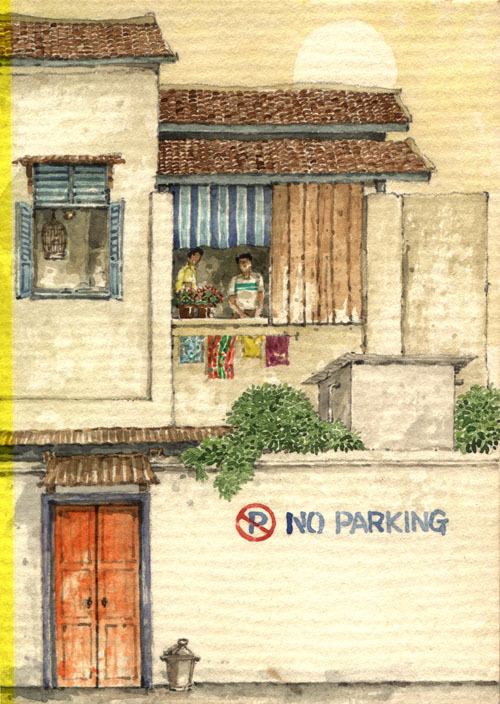 Works in The Postcard Story illustrate Chin's capability to seek and depict interesting scenes, people and street corners that have often been overlooked in our mundane life. 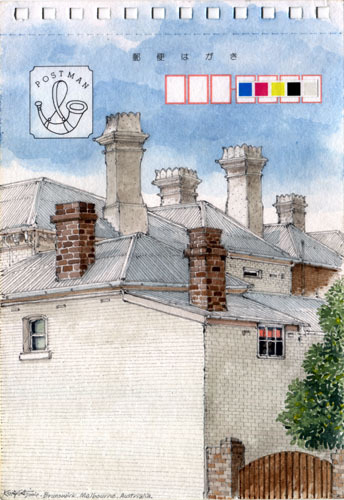 He is fond of depicting the traditional trades like old provision stalls, coffee shops, roadside bookstands and back lane food corners. Bicycles and tricycles/trishaws of Kuala Lumpur, Penang and Malacca are Chin favorites because they all have sentimental value to him, as they were also part of his childhood memory, and most of all, indicatives of a passing era that is irretrievable. At the first glance, Chin Konyit The Postcard Story may appear idyllic and nostalgic. A closer look, these works are visually rich, and each has its story to tell. Chin depicts his surrounding with a sincere heart and eyes of a humanist. May it be the back street scene of a city, a fishing village, a street hawker or a phone booth, they are all unequivocally Malaysian. The interesting juxtapositions of the old and the new, the ordinary and the rare, the traditional and the modern, make Chin's works unique and enduring.